The Awami League has swept an electoral landslide only seven months ago, promising to change the country and its politics. In the council that it has held last Friday, it has been business as usual, with the predictable outcome: Sheikh Hasina has been elected as the party President for the sixth time in a row and Syed Ashraful Islam, assistant secretary general in the outgoing committee, has been elected as the new party General Secretary; for both the posts there have been no other candidates. For the 45 posts of the central working committee, the council has delegated power to the new President and General Secretary; a move that has put the AL, the biggest democratic party in the country, under criticism. What can the party, which was the vanguard of the country's independence, do to infuse intra-party democracy and bring in fresh blood in its leadership, both of which have been miserably missing in the country's politics? Sixty-year-old rickshawpuller Alam Miah, who voted for the Awami League in the last elections and a member of the party, cannot think of anyone but Sheikh Hasina to lead the party which is as old as he is. 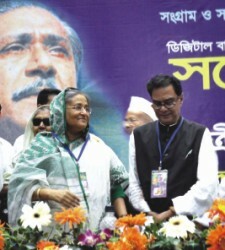 Last Friday, he eagerly waited in front of the newly christened Bangabandhu International Conference Centre. His wait was over as soon as Hasina was elected unanimously by 5,253 councillors. He left the venue in an hour, reassured that his leader Bangabandhu Sheikh Mujibur Rahman's daughter would lead the party. "It will be good for the country," he said. However Awami League's 20th council has failed to impress Imtiaz Ahmed, professor of International Relations at Dhaka University. "I had greater expectations and I think this particular council could not deliver," he says. What Imtiaz finds particularly unimpressive is the way the council has elected the President and General Secretary. "People this time thought that they would go for serious elections, that there would be votes and at least two or three candidates would fight," he says. Hasina's election in the council has come as no surprise. Even though she has not been elected through secret ballot, given the popularity that she enjoys in the country, not to mention inside the party, there is little doubt that if transparent ballot boxes were used she would still have bagged all the 5,253 votes. The newly elected President and General Secretary of Awami League. The council was supposed to elect a 73-member central working committee (CWC), but instead it delegated the power to choose 45 members of the CWC to the new President and General Secretary. The AL constitution empowers the party President to handpick the remaining members of the CWC. "It was told that democratic principles would be followed (in the council)," Professor Muzaffer Ahmed, eminent economist and member of the Transparency International Bangladesh (TIB), says. He thinks that this is not the way democracy works. Professor Imtiaz Ahmed also thinks voting was necessary. "The prime minister herself said that transparent ballot boxes would be brought. This is an old way of electing leadership," he says. Even though some councillors say that the council's chief election commissioner MA Mannan made the proposal, the veteran leader however denies any foul play. He told The Daily Star that no one filed their candidacy for other posts; "We even received a proposal from a councillor to empower the newly elected president and general secretary to choose leaders for the rest of the posts. The councillors unanimously delegated their power to the president and general secretary," he said. Professor Imtiaz says that giving power to two people is a weakness in democracy. "You cannot give power to someone to dominate all," he says. He hopes that three years from now on things will change, and the party will work for more internal democracy. Syed Ashraful Islam agrees. He says, " It is true that the people of the country want the Awami League to be more democratic. We had a voter list for the council; we had all the preparation for elections. But as there wasn't more than one candidate, elections could not be held. That does not mean that the process in which leaders were elected cannot be called democratic. Efforts will be made in the future so that there are more candidates and party leaders are elected through direct votes of party councillors." There is a popular expectation that the council will elect a set of leaders that will be different from those who are now holding ministerial posts to prevent meddling of party interests in ministerial responsibilities. "That expectation is also foiled because the party president is the prime minister," Imtiaz says. Now that Sheikh Hasina is vested with the power to choose a new team, it can be hoped that she is going to pick fresh leaders, not those who are performing different ministerial duties. "For democracy to work properly the party and government should be run by two sets of people," Professor Muzaffer Ahmed says. He thinks that the party should work as a watchdog, keeping the government on its toes. Professor Muzaffer cites the famous example of former Tamil Nadu Chief Minister Kamaraj Kumarasami who, to invigorate the Indian Congress, proposed that all senior Congress leaders should resign from their ministerial posts and devote all their energy to the party. Elected the Chief Minister of his state three consecutive times, he duly resigned from the post of the chief minister to make room for new leadership. 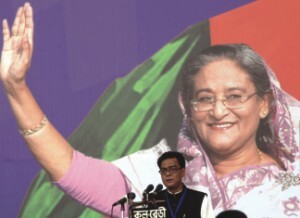 Sheikh Hasina has steered her party towards a historic victory through her statesmanship. Her speeches in the run up to the general elections had shown vision to a nation that teetered on the brink of social and political chaos. Her urge to create a modern 'digital' Bangladesh earned her a huge fan following among the first time voters. History will be kind on her if she rises up to the occasion and picks a young dynamic leadership as her colleagues in the presidium and the CWC. Those who hold the ministerial posts must not be given organisational duties. Only tested young and honest leaders should be picked to run the party. 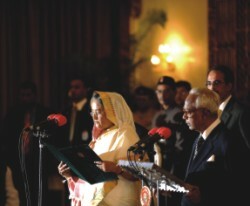 Sheikh Hasina taking oath as Prime Minister. Historically the ruling party General Secretary has always been bestowed with the responsibility of running the Local Government, Rural Development and Co-operatives (LGRD) Ministry. In effect the ministry becomes a bastion of ruling party lobbyists who try to take undue advantages of their close proximity with the party in power. It is hardly surprising that on several occasions, the ministry has featured in the list of the TIB as one of the most corrupt ministries. Now that Syed Ashraful Islam, the LGRD minister, has been elected the General Secretary of the Awami League, a certain degree of apprehension is there that there will be a conflict of interest. Ashraful was famous for his bold stance during the state of emergency imposed by the last caretaker government. He will set a good example if he decides to resign from the LGRD minister to put all his energy to strengthen his party at the grassroots. It will be a healthy sign for the country's fledgling democracy, not to mention the fact that for the first time since the restoration of democracy in 1991, a ruling party will get the attention of a secretary general who is not overloaded with ministerial duties. As the requirement of the Representation of People's Order requires that every registered party hold its council by July 24, the AL's last council was a hurriedly done affair and it has left room for improvement. Now is the time Sheikh Hasina infuses fresh blood in the party and concentrates more on the internal democracy of the party. "A democratic party's strength is in its democracy," Imtiaz says, "take Muslim League, one of the reasons why the party has gone into oblivion is because it did not practice internal democracy in its fold. If democracy is not practised rigorously the party might not be able to return to office in the next general elections." The onus now lies on Sheikh Hasina and her foresight to decide a team that is going to lead the five-decade old Awami League into the challenges of the new millennium. In its chequered history the party has won the general elections in Bangladesh thrice, twice it was blessed with absolute majority. Bangladesh's history is entwined with the rise of the Awami League, it has led the country towards independence, and it has been at the forefront of all the democratic struggles against different military dictatorships that have plagued the country for half its life. "As a party that led Bangladesh towards independence, our expectations from the Awami League are high," says Professor Imtiaz, "This council has not met those expectations. I hope that it will be better next time." Syed Ashraful Islam assures that it will be different in the future. He says, "We do not want to go back to confrontational politics. We want to change the country and its political culture and for this we need the support from all political parties. Awami League is a part of the society in which we live. It is not practical to think that the party is immune to the disease that has infested the country. But that day will soon come when the leaders of the party will be elected through ballot." One only hopes that he keeps his promise. 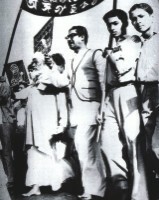 Bhashani and Bangabandhu leading a procession in memory of the Language Martyrs. June 23, 1949: East Pakistan Awami Muslim League formed, breaking away from All Pakistan Muslim League. Maulana Abdul Hamid Khan Bhashani was its first President, its first general secretary was Shamsul Hoq and Treasurer was Nurul Islam Chowdhury. Sheikh Mujibur Rahman, Khondokar Mostaq Ahmad and AK Rafiqul Hussain were its first three joint secretaries. 1952: Awami Muslim League and its student wing play an instrumental role in the Language Movement that can be termed as the beginning of our independence struggle. October 21, 1953: In a council meeting it drops the word Muslim from its name. March 8-12, 1954: Awami League takes the lead in forming the United Front (UF), later known as the Jukta Front with Krishak Sramik Party, Nizam-e-Islam and Ganatantri Dal, forming a 21-point charter, written by Abul Mansur Ahmad, with 'Boat' as the symbol to fight the Muslim League in the East Bengal Legislative Assembly elections. Muslim League (ML) faces a humiliating defeat: of the 237 Muslim seats, the ML secures only 9 seats as against 223 seats by the UF, of which Awami League bags143 seats. March, 1954: Shere Bangla AK Fazlul Haq of Krishak Sramik Party leads the UF government. May 29, 1954: Using section 92/A of the provisional constitution of Pakistan, Governor General Pakistan dismisses the Jukta Front government. March 23, 1956: First constitution of Pakistan formed. Awami league welcomes it. 12 September, 1956 to 11 October, 1957: Awami League cobbles up a coalition with the Republican Party at the centre and runs a government that Awami League leader Huseyn Shaheed Suhrawardy leads. February 7-8, 1957: Bhashani calls a conference at Kagmari in protest of Awami League leadership's support to the government's move to join the Southeast Asia Treaty Organisation (SEATO) and Central Treaty Organisation (CENTO). It earns Bhashani the title Red Maulana, he forms his own party National Awami Party; Awami League formally splits. October 7, 1958: Iskander Mirza, the then Governor General, declares martial law; General Ayub Khan is made its chief martial law administrator. October 27, 1958: Ayub deposes Mirza in a bloodless coup. Political Parties Elected Bodies Disqualified Ordinance promulgated, which practically disbands all political parties. All major political leaders arrested on charges of corruption. Most major leaders of Awami League are arrested. February 6, 1962: Sheikh Mujibur Rahman is arrested again under the Public Security Act and is released four days later. June 1962: Ayub Khan comes up with his own Constitution, modelled on indirect election, through an electoral college, and termed it 'Basic Democracy'. Instead of reviving the Awami League, Huseyn Shaheed Suhrawardy joins hands with Nurul Amin, Khwaza Nazimuddin, Maulvi Farid Ahmed and Hamidul Haq Chowdhury to form National Democratic Front against Ayub Khan's military-backed rule, to restore democracy and force and election. December 5, 1963: Suhrawardy mysteriously dies in Lebanon. He is found dead in his hotel room. March, 1964: In a meeting initiated by Sheikh Mujibur Rahman, All Pakistan Awami League meets at Dhaka to revive the party. Nawabzada Nasrullah Khan becomes the president and Shamsul Hoq the general secretary. Sheikh Mujibur Rahman becomes the chief of East Pakistan Awami League. January, 1965: Fatema Jinnah, sister of Pakistan's founder MA Jinnah, is given support by the Combined Opposition Party as the Presidential candidate. She loses to Ayub Khan. February 5, 1966: Sheikh Mujibur Rahman places the famous Six-points charter at a conference of all political parties in Lahore. Nawabzada Nasrullah Khan, the president of All Pakistan Awami League opposes, a break-up of the party becomes imminent. March 1, 1966: A council meeting of the Awami League is called and it elects Sheikh Mujibur Rahman as the President and Tajuddin Ahmed the general secretary of Awami League. May 8, 1966: Sheikh Mujibur Rahman was arrested under the Defence of Pakistan Rules. "Those who speak of the six points will be met with the language of weapons," Ayub Khan says. Major Awami League leaders are arrested. June 7, 1966: A strike is called to protest the arrests; as all the major leaders are in jail, organisational secretary of Awami League Mizanur Rahman and the party's woman leader Amena Begum call the strike. December, 1967: Pakistan government lodges the so-called Agartala Conspiracy. January, 1968: Agartala Conspiracy. A list of 35, the so-called conspirators, which Bangabandhu Sheikh Mujibur Rahman tops, is disclosed. June 19, 1968: A Special Tribunal starts its proceeding. The judges are Justices SA Rahman, Mujibur Rahman Khan and Maksumul Hakim. January 19, 1969: Asaduzzaman Asad, Dhaka Hall leader of Leftist East Pakistan Students Union, is killed by the police in a major demonstration. Students place their 11-point demands, which spark a mass upsurge against Ayub Khan. February 15, 1969: Sergeant Zahurul Haq, an accused in the so-called Agartala Conspiracy Case is murdered in Dhaka Cantonment. February 19, 1969: Maulana Bhashani declares that he is going to take people to storm the cantonment if Sheikh Mujib and other accused are not released. February 20, 1969: The house of SA Rahman, the chief Judge of the Conspiracy case, is torched; he leaves Dhaka and never came back. 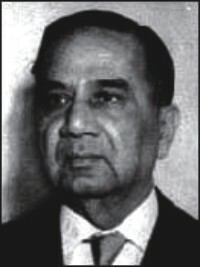 February 22, 1969: Rear Admiral AR Khan, defence minister of Pakistan, declares that the so-called Agartala Conspiracy case has been withdrawn. 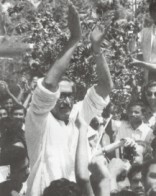 Sheikh Mujibur Rahman is released after about three years in captivity and receives a tumultuous welcome by the people. February 23, 1969: In a speech at an all-party student mass rally at the Race Course, Tofail Ahmed, a student leader, on behalf of the All Party Students' Action Committee, bestows on Sheikh Mujib the title 'Bangabandhu', the 'friend of Bengal'. It soon becomes a symbol of adoration for Sheikh Mujib who rises to become the supreme leader of his people. February 26-March 13, 1969: Bangabandhu places Six-points and 11-points at the Round Table Conference at Rawalpindi. The conference reaches a stalemate as the Pakistani junta refuse to accept Bangabandhu's demands. March 25, 1969: General Yahya Khan, who two years later would launch a bloody assault on the Bengalis on March 25, 1971, seizes power in a bloodless coup. January 6, 1970: Bangabandhu is re-elected the president of Awami League. October 17, 1970: Bangabandhu selects 'boat' as the Awami League's election symbol for the general elections; the party starts its elections from a rally at Dhaka's Dholai Khal. November 12, 1970: A devastating cyclone rips through East Pakistan, killing around 500,000 people. Awami League joins relief effort. December 1970-January 1971: In the all Pakistan general elections, of the 300 seats, Awami League wins 160, Pakistan People's Party gets 81. The ruling Pakistani establishment refuses to handover power to the Awami League. January 27, 1971: Zulfiquar Ali Bhutto, leader of Pakistan People's Party arrives in Dhaka to form a coalition with the Awami League. The talk collapses. March 1, 1971: Yahya Khan postpones the National Assembly session. March 3, 1971: A general strike called by the Awami League cripples the whole of East Pakistan. 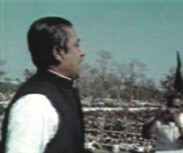 Bangabandhu's historic March 7 speech. March 7, 1971: Bangabandhu Sheikh Mujibur Rahman at a mammoth rally at Race Course says, "This struggle is the struggle for freedom, this struggle is the struggle for independence." He calls for civil disobedience against the junta. March 16-24, 1971: Bangabandhu, Yahya Khan and Zulfiquar Ali Bhutto have talks about handover of power. The talks fail; Yahya and Bhutto leave East Pakistan. March 25, 1971: General Yahya and his butchers start one of the most gruesome genocides in modern history. The Operation Searchlight alone kills hundreds of Bengalis on the night of March 25. Before his arrest from the historic house of Dhanmandi 32, Bangabandhu is said to have declared Bangladesh's independence at the zero hour of March 26. March 26-December 16 1971: Awami League successfully leads one of the bravest resistances in human history. On April 17, the Bangladesh government is formed at Mujibnagar with Bangabandhu Sheikh Mujibur Rahman as the President in absentia, Syed Nazrul Islam as the Acting President and Tajuddin Ahmed as the Prime Minister. Members of Awami League fight hand in hand, shoulder to shoulder with the masses. Three million Bengalis embrace martyrdom. January 10, 1972: Bangabandhu reaches Dhaka to a tearful welcome, two days later he becomes the Prime Minister of the newly independent country. March 7, 1973: First general elections in independent Bangladesh held. Awami League wins an electoral landslide; of the 300 seats, it alone wins in 293 constituencies. October 26, 1974: Tajuddin Ahmed, the man who was the Prime Minister of the government in exile and also led the Liberation War in Bangabandhu's absence, is told to resign. February 24, 1975: One party-government system is introduced. All the political parties are banned to create Bangladesh Krishak Sramik Awami League. All newspapers are banned; the four newspapers, which are allowed to be published, are government-controlled. Presidential government is formed. August 15, 1975: On one of the darkest nights of our history, Father of the nation, Bangabandhu Sheikh Mujibur Rahman is assassinated along with all but two of the members of his family by a bunch of deranged disgruntled mid-ranking army officers led by Lt Col (sacked) Faruk Rahman. 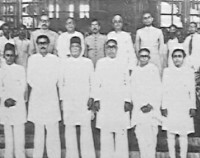 August 16, 1975: All but five major Awami League leaders take oath in the new cabinet headed by Khondokar Mostaq Ahmed. Those who did not take oath in the cabinet of killers are: Syed Nazrul Islam, Tajuddin Ahmed, Kamruzzaman, Captain Mansur Ali and Dr Kamal Hossain. November 3, 1975: Syed Nazrul Islam, Tajuddin Ahmed, Kamruzzaman and Captain Mansur Ali, four leaders kept in prison, are murdered. November 4, 1975-May 16, 1981: Awami League faces the toughest time in its history. For these six years the party has been practically leaderless. Those who have tried to lead the party are: Mizanur Rahman Chowdhury, Abdul Malek Ukil and Zohra Tajuddin, of them the latter's contribution is commendable. 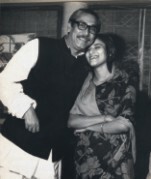 Bangabandhu with his daughter Sheikh Hasina. May 17, 1981: Sheikh Hasina becomes the Awami League's President, following her return from exile after her father's assassination. May 18, 1981-May 6, 1986: Sheikh Hasina leads the party under the military dictatorships of Generals Ziaur Rahman and HM Ershad. May 7, 1986: General elections under Gen HM Ershad. Hasina decides to participate in the elections; Awami League wins 73 seats, becomes the main opposition. January 1989-December 6, 1990: Awami League and Bangladesh Nationalist Party (BNP) lead a mass upsurge that ousts the despotic rule of General HM Ershad. February 27, 1991: General elections. The BNP wins the elections with 169 seats; Awami League gets only 92. 1993: Awami League faces a split; Dr Kamal Hossain leaves to form Gono Forum. 1994-1996: Awami League under the leadership of Sheikh Hasina leads a popular movement against the BNP government to establish the caretaker government system. February 15, 1996: Awami League wins the elections, getting 146 seats. 1996-2001: Sheikh Hasina's first term in office. Two of its major achievements are striking the water sharing treaty between Bangladesh and India, and the signing of a peace treaty with Jana Sanghiti Samiti. October 1, 2001: The Awami League loses the elections. It gets only 62 seats, compared to the BNP, which wins in 193 constituencies. August 21, 2004: Grenades are thrown at a rally organised by the Awami League. Sheikh Hasina survives the assassination attempt. But 23 party members, including the women's affairs secretary Ivy Rahman, die. January 27, 2005: Awami League leader Shah MS Kibria is murdered in a grenade attack. November-December, 2006: Awami League launches street agitation against President Iajuddin Ahmed's caretaker government. July 16, 2007: Sheikh Hasina is arrested on charges of corruption. Many other Awami League leaders also face corruption charges. June 11, 2008: Hasina is released from prison. December 29, 2008: Awami League-led Grand Alliance wins the general elections winning 230 seats. Sheikh Hasina starts her second term in office.